Christmas isn’t that far away and friends and family will be wondering what gifts to buy for a stage lighting devotee. Should it be a new LED headtorch ? Or a Leatherman Wave ? Let’s hope they’re not veering towards a Rick Astley’s Greatest Hits Album (No, I just can’t do it – Rickrolling OSL readers isn’t my style). On Stage Lighting is dedicated to helping our readers – even helping to avoid the avocado lounge suit Granny was going to knit for you this Christmas. We’ve been busy designing some seriously “lampie – tastic” Lighting Crew T Shirts with all original humour and graphics. There is a good number of designs at the store, with even more to be added in the near future. Where is all this lampie swag, then? 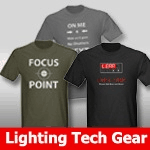 Working through the Cafepress webshop portal, we are proud to announce the On Stage Lighting Crew T Shirt Store. There are unique designs for LX techs, stage crew, LD’s and even some funky Crew Chick tops. 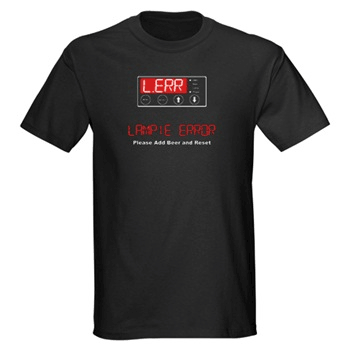 Our best selling Limited Edition T shirt “Lampie Error – Please Add Beer and Reset” had it’s shelf life extended by popular request so if you are quick, you can still get an order in time for Christmas. Can I get On Stage Lighting Swag in [insert country here]? Cafepress is a well known printing and sales platform, based in the US. They are used to shipping all over the world at very competitive rates. Although the site is priced in USD, a quick conversion into your local currency will confirm that the T Shirts are priced to be attractive to buyers outside the US too. They also have a solid return sytem, so the buying from Cafepress is risk free. Ok, so you think you’ve already got enough rigging T shirts but come on, these are exclusive items that you won’t find anywhere else. And if you do, we want to know coz I hold the copyrights to them! Returning to your normal On Stage Lighting service after this message…. Let us know what lampie stuff you want for Christmas this year? If you have stage lighting christmas gifts that you are hankering after, let us know what they are in the comments box below. (You can post ONE affiliate link on this page, as long as they are to genuine stage lighting related pressies). Tell us why you why you want it and we can get a little christmas list together. Can’t guarantee the Santa is on OSL reader but you could always add the URL in this years letter to him. Point your Granny to this page to pick up some ideas on what us lampies like for xmas. Books, tools, your own industrial pot of Sudocrem (if you don’t know, I aint gonna tell you), anything. Let’s hear it, put your christmas wishes in the box below. Concert Lighting Techniques – Know The Rig or The Show? Dear Santa, Please can I have an Bumper Packet of Black Sharpies. Could i please have 4x Acme Winner scanners, 4x Showtec LED Pars, A behringer dmx controller, a portable goalpost lighting rig, And a Peguses equinox 4 head laser. Also could i please have a Girls cars and bars of pars t shirt as it made me lol. I’m part of a group putting on a pantomime in February for charity, but we are missing people to do lighting. I was wondering if you might now of a forum, or somewhere I could advertise for this? A long shot but thought I’d ask! If you are in the UK, check out the Blue Room. Another good source for humourous industry-related shirts is my friend’s site: http://www.roadierags.com. All shirts are 15% off, from 11/28-12/24/08. Me and a mate are doing sound/lighting for a show coming up this year. I’ve got a good slogan for the front of my t-shirt, but I can’t think of anything funny for my friend’s… We are getting them made online.